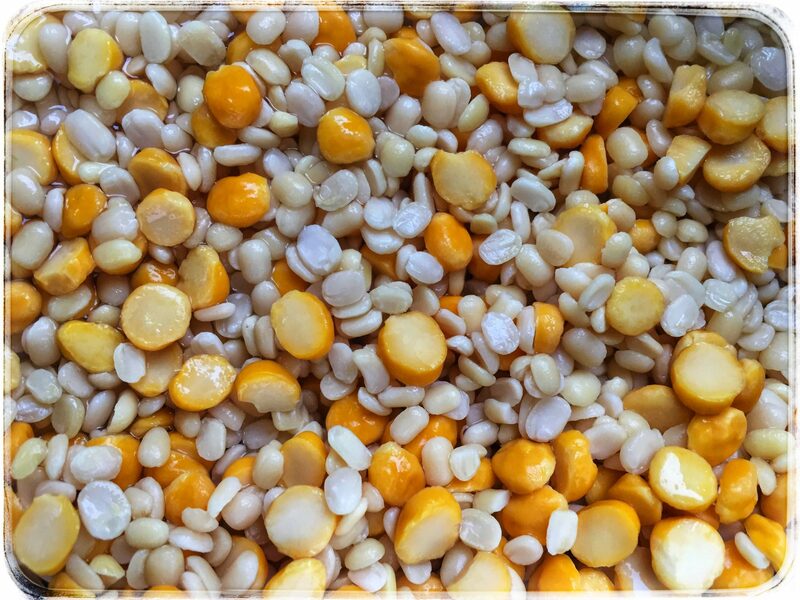 A delicious and creamy mix of urad daal (split white lentils) and chana daal (split Bengal gram). This is famously known as maa chole/ maa chane daal in Punjab, and is a healthy and perfect daal/ lentils on days when you do not want to have heavy dinner, and not spend much time in the kitchen cooking.This is a healthy, wholesome, tasty and full of protiens. I guess all lentils/ legumes are a staple part of Indian diet, and are regular cooked every week. This one is also a regular daal in Punjabi households, and tastes best with raw fresh cut onions or even pickled onions, mango pickle, and fresh rotis/ naan/ tandoori roti or rice.The spices used for simmering and tempering this daal make it really light on your tummy and easy to digest, and for this reason this is generally had in summers. Though here in UK, I cook it in winters as well, mostly as a soup to give it to my daughter as it is really healthy for kids as well. 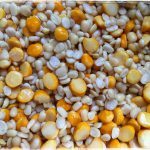 Lentils are a great source of protiens, and a power pack of other healthy goodness for all. 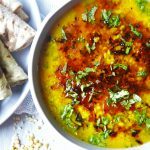 The tempering for this daal, cooked in pure ghee, cumin seeds, and onion give it a beautiful smoky rustic flavour, that never fails to satisfy your palettes. 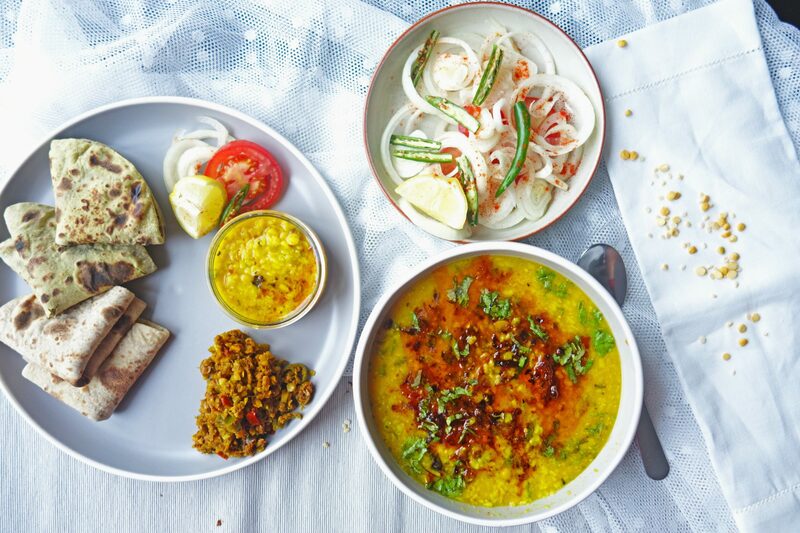 If you do not want to have it the traditional Indian way , with Naan / roti, you can even have it as a lentil soup ( as this is really creamy )with accompaniment’s such as- crusty mini cheese bruschetta, garlic breads, toasted and buttered ciabatta, and fresh green salads. 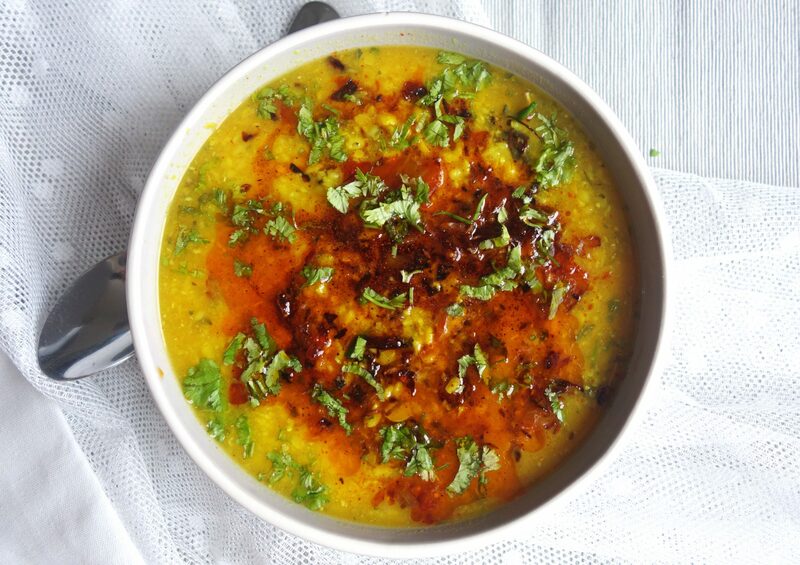 For this recipe, you would need a mix of split urad daal, and chana daal. Both are easily available in all super stores here, and asian stores as well. I use more of urad daal, and less of chana daal. 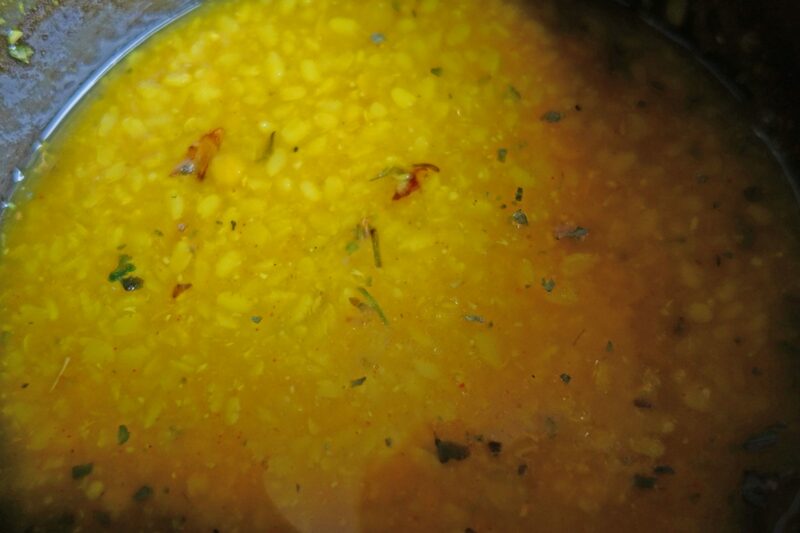 As urad daal dissolves in water, it gives this daal a creamy texture, and chana daal adds the nutty texture to this daal.I use 3/4 cup urad daal, and 1/4 cup chana daal. Wash and rinse the daals thoroughly in water.If you are making this in pressure cooker you can just soak it in fresh water for 10-15 minutes, or it will be ok if you do not soak it at all. Add the mix in 4-5 cups of boiling water. Add roughly crushed or finely chopped ginger, garlic. Also add asafoetida powder, salt, red chilli powder and turmeric powder.Let it pressure cook for 2 whistles, and turn off the heat. Most of the people add only salt, and boil daal, and add rest of the spices mentioned above during tempering. 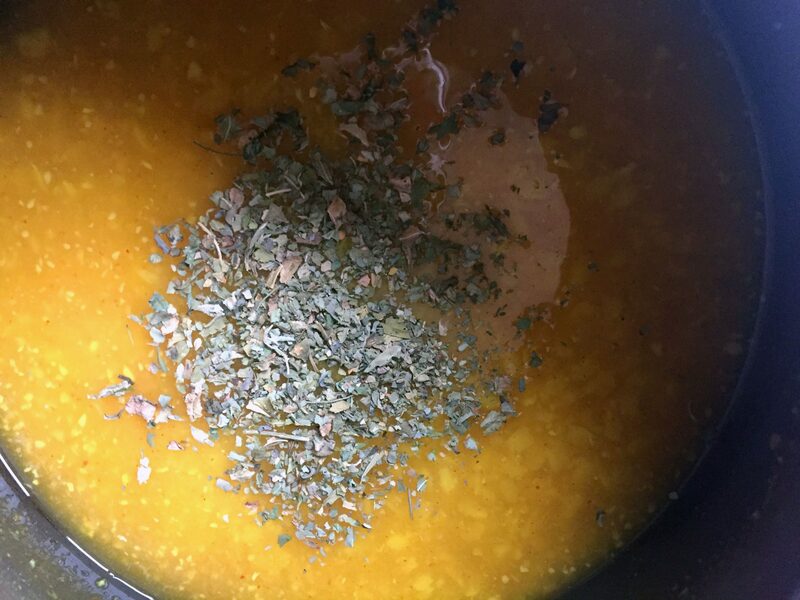 But my mum cooks most of the daals this way, and even I like cooking all my daals this way as when the lentils are cooked along with these spices, they absorb the flavours really well, and taste beautiful even without the tempering. This mix can be had as a soup in winters without the tempering. This is not much spicy and has no fat at this point.So if you want no fat daal, it is a great way to have it. 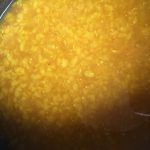 Once it is cooked, open the pressure cooker, and check the consistency of the daal, you will notice that both the daals have become tender, and if you try to crush it in your fingers, these can be easily crushed using your thumb and index finger. Now add kasoori methi (crushed dried fenugreek leaves),mix it well. Cover it and let the daal simmer on low heat for another 8-10 minutes. 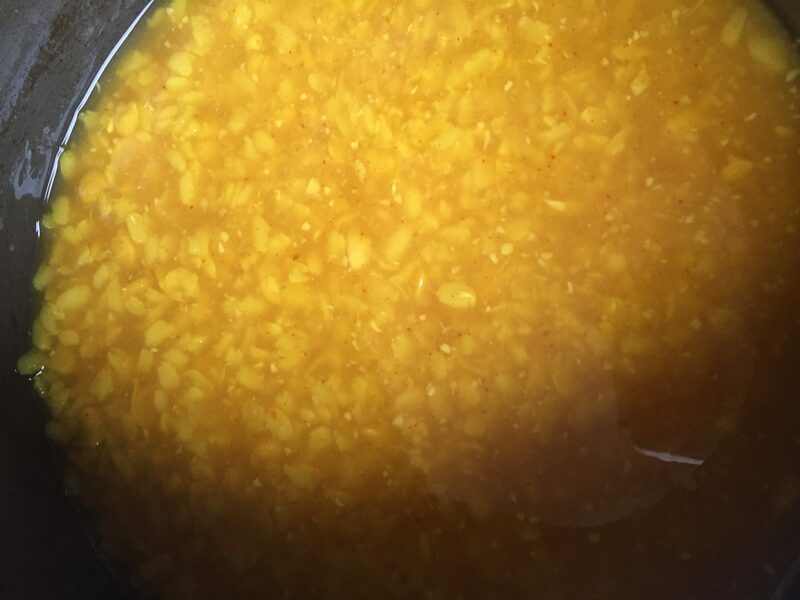 If you do not have a pressure cooker, you should soak the washed daal mix in fresh water overnight or for 5-6 hours, and then cook it with the above ingredients in a covered pan. It takes longer to cook in pan, so you will have to let it simmer for almost 20-30 minutes. 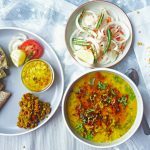 Once the daal reaches a creamy consistency – the urad daal is almost creamy, and chana daal will also be nutty, chewy but tender. Take it off heat. At this stage , your daal is completely cooked, and tastes delicious. You can have it without the tempering as a soup. And this is the stage I usually take out a bowl (before tempering ) for my daughter as she does not like it too spicy. 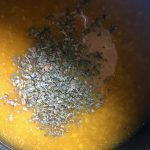 Just top it with a tsp of melted ghee (this is optional), and it is a really healthy soup for your kids or even for grown ups who would want it without any spice, and fat. For the traditional Punjabi daal, Now is the stage to prepare the tempering. In hot ghee, add cumin seeds. 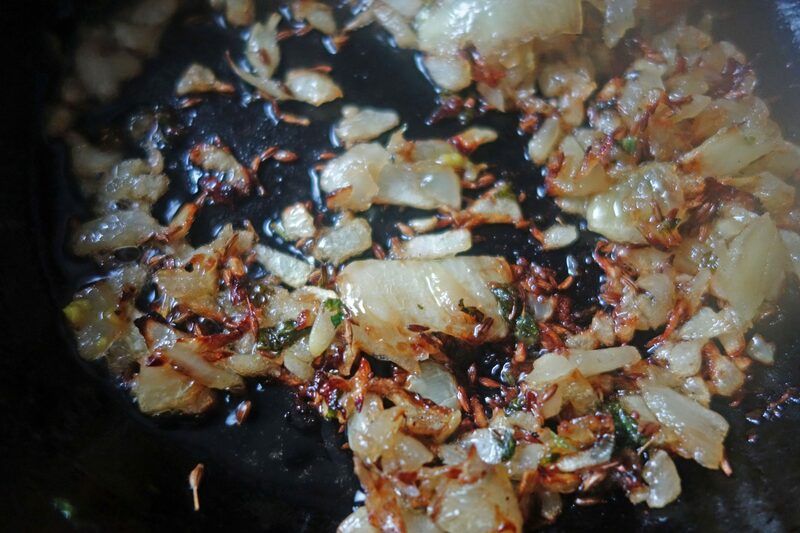 When these start spluttering, add finely chopped onions, Let it become golden and crispy. Add chopped or slit green chillies. 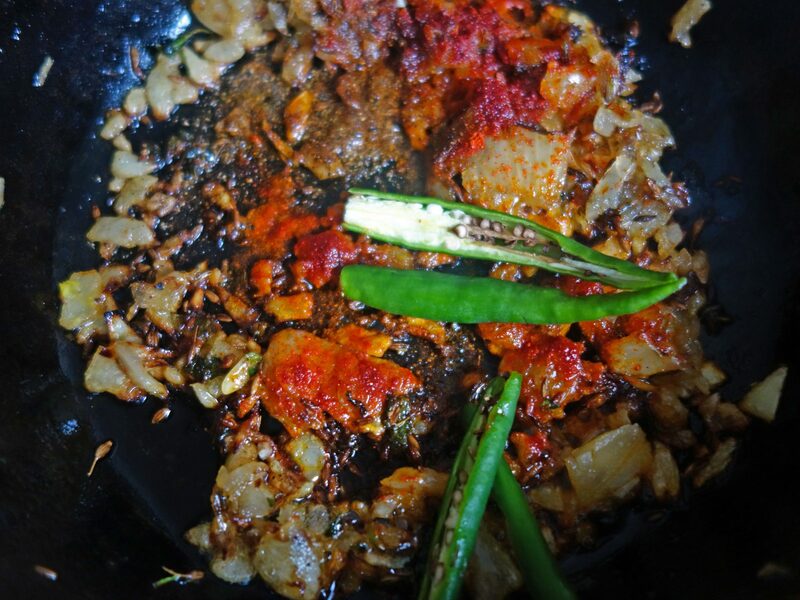 Cook for a minute.Add Degi mirchi or paprika- this adds a beautiful red colour to your tempering and is not too spicy. 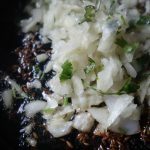 Add coriander powder, garam masala, and slit or chopped green chillies. 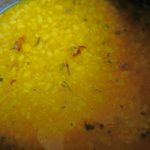 Mix well, and add the cooked daal carefully to this hot tempering- be careful as it immediately start splattering.Mix it, garnish this with fresh chopped coriander leaves, and slit ginger juliennes/ green chillies and ghee. Serve it hot with fresh rotis/ tandoori roti/ naan, accompanied with fresh or pickled onions, salad and pickles.In the below picture, I served this with regular rotis and spinach rotis ( the green ones), along with minced soya vegetable, and fresh salad. Do leave your comments below, if you like the recipe. Add roughly crushed or finely chopped ginger, garlic. Add asafoetida powder, salt, red chilli powder and turmeric powder.Let it pressure cook for 2 whistles, and turn off the heat. In hot ghee, add cumin seeds. 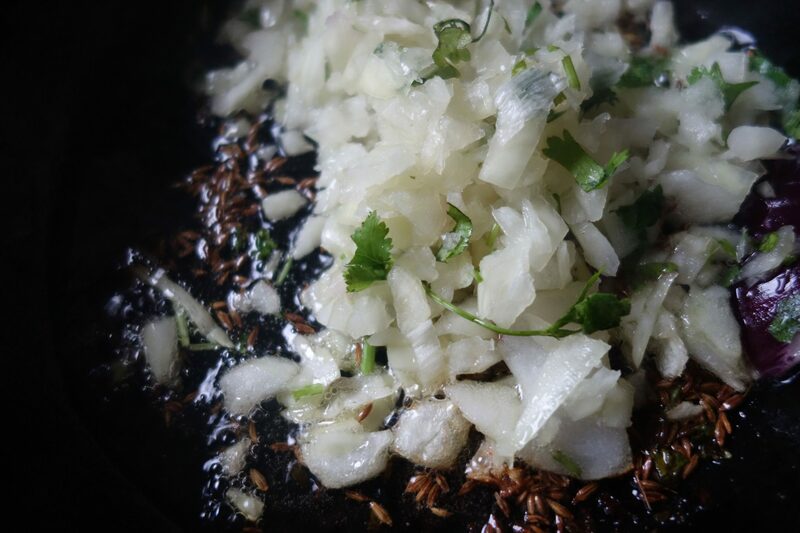 When these start spluttering, add finely chopped onions, Let it become golden and crispy. Add chopped or slit green chillies. Cook for a minute. 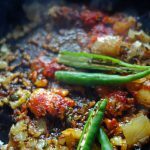 Add Degi mirchi or paprika- this adds a beautiful red colour to your tempering and is not too spicy. 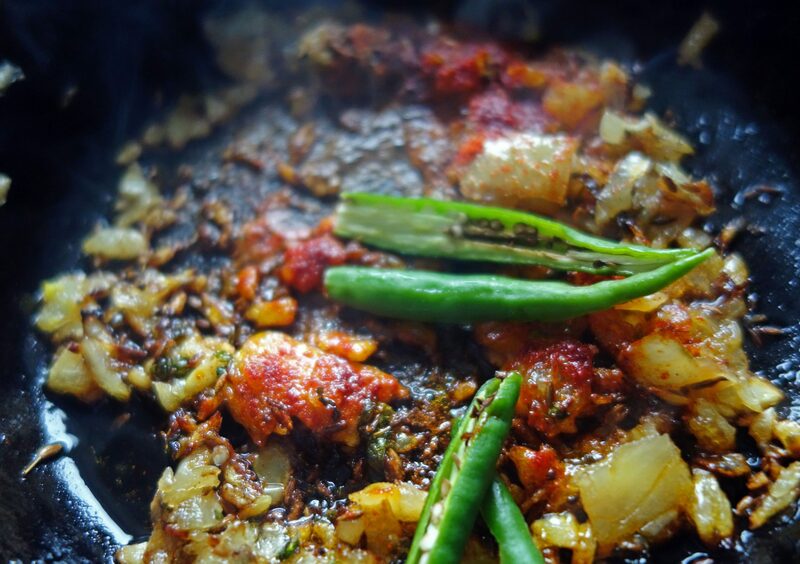 Add coriander powder, garam masala, and slit or chopped green chillies. Mix well, and add the cooked daal carefully to this hot tempering- be careful as it immediately start splattering. Mix it, garnish this with fresh chopped coriander leaves, and slit ginger juliennes/ green chillies and ghee. Serve it hot with fresh rotis/ tandoori roti/ naan, accompanied with fresh or pickled onions, salad and pickles. If you do not have a pressure cooker, you should soak the washed daal mix in fresh water overnight or for 5-6 hours, and then cook it with the above ingredients in a covered pan. 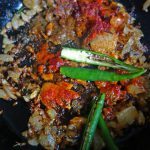 It takes longer to cook in pan, so you will have to let it simmer for almost 20-30 minutes.once done, rest of the recipe remains same.Follow the steps for tempering.